The first step of planning the foundation was to go to the job site and stake out where the exact location, or foot print, of the home will be. For this custom log home near Bozeman, Montana we actually stacked it out a total of three times. It is very important to not rush this step of the process. Once that foundation is in place there is no realistic way to move it again. 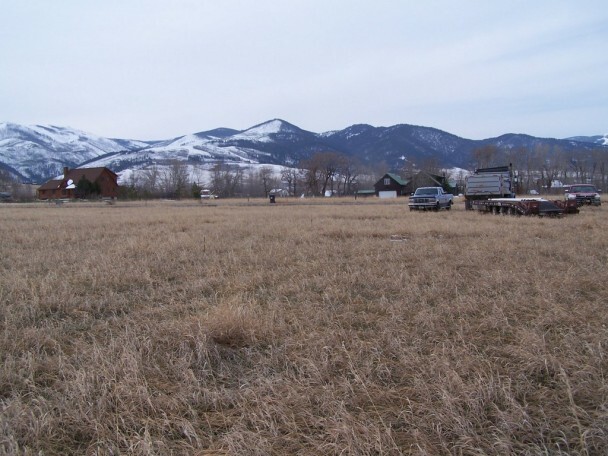 The overall lot size is just over two acres. 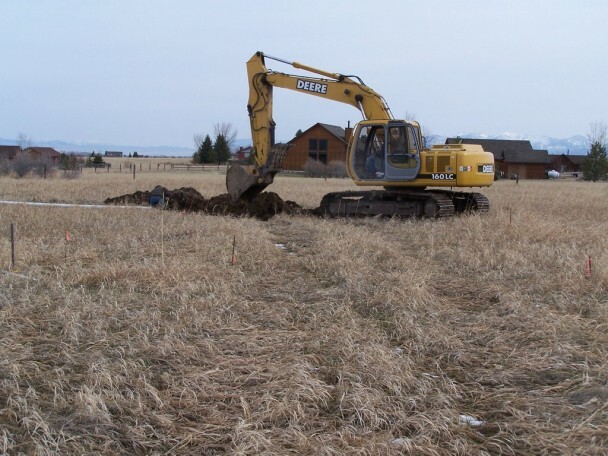 Since the well and septic were already in place when the owners purchased the property there was a few more pre-existing conditions to deal with than usual. As you can see, the property is almost level. The owners wanted to be sure their log home would be turned just right to take full advantage of the Bridger Mountain Views. With the wall of windows on the end of the great room, it would be a waste to turn it any other way. If you look closely in the center and to the left of the photo you will see two stakes marking part of the home location. Part of the complications with choosing the exact location dealt with the distance between the log home and the septic. With very little slope to the property the distance between the two could not be extremely far. For this job we brought in a track hoe. This machine possess enough power to dig quickly and work around any large rocks that we may encounter. With this huge bucket we were able to dig trenches and also the entire foundation and footer with the same machine. In this photo above we are locating the septic tank. 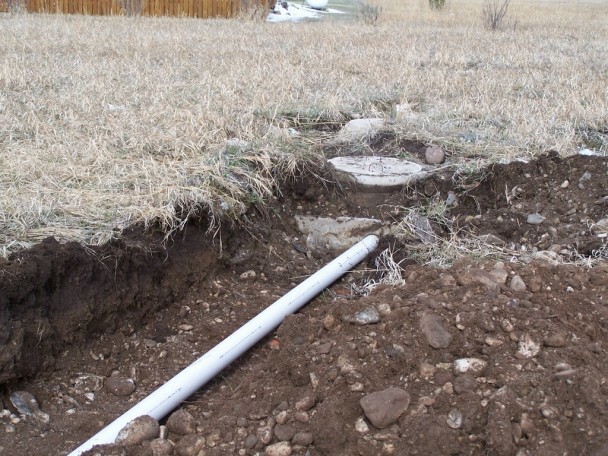 From there we will begin trenching and laying in the septic pipe. 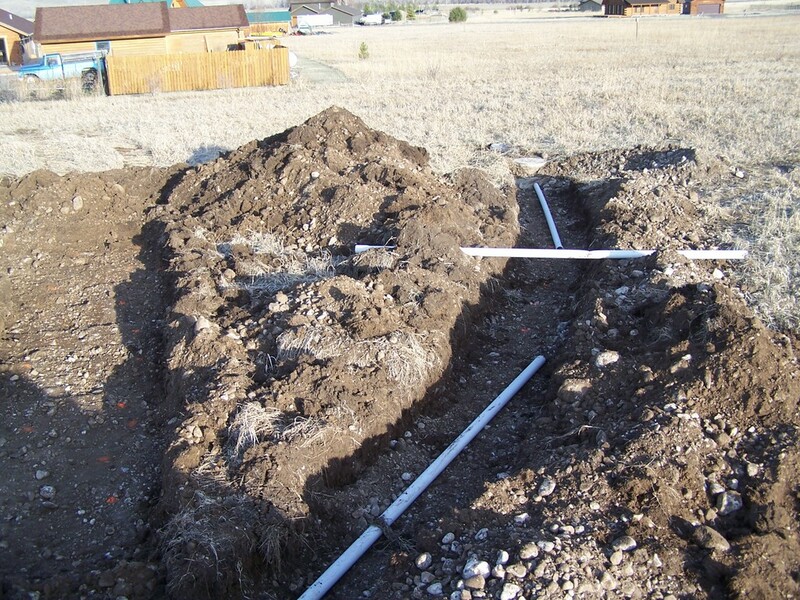 In this photo below you can see the top of the septic tank and the first length of pipe. The next part involved digging the foundation. For the main part of the home a four foot crawl space is going to be used. For the garage a cement slab will be poured. The photo below shows the crawl space area. The deeper walls are showing. Overall the foundation will extend past the final grade by about 8 to 12 inches. This second photo shows the garage slab area. Notice how it is not as deeply dug as the four foot crawl space section. 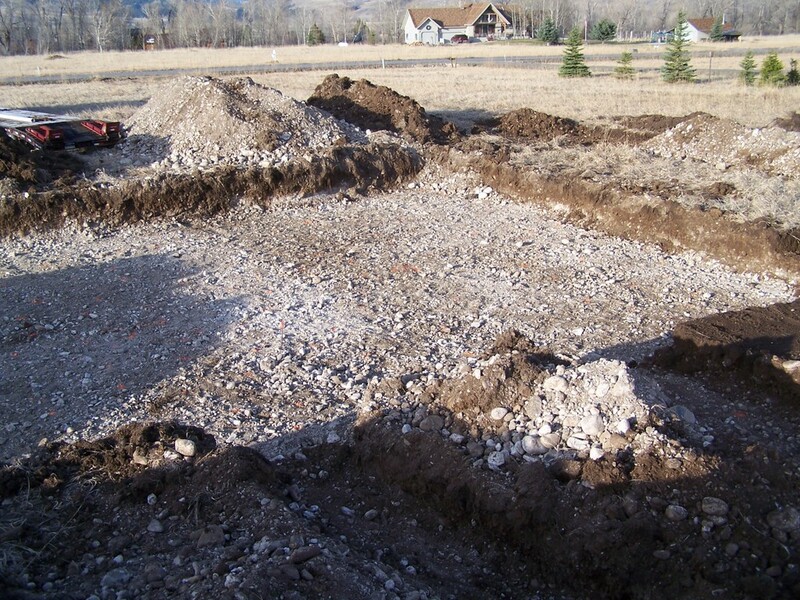 Once excavation is finished then gravel will be evenly spread over the area. 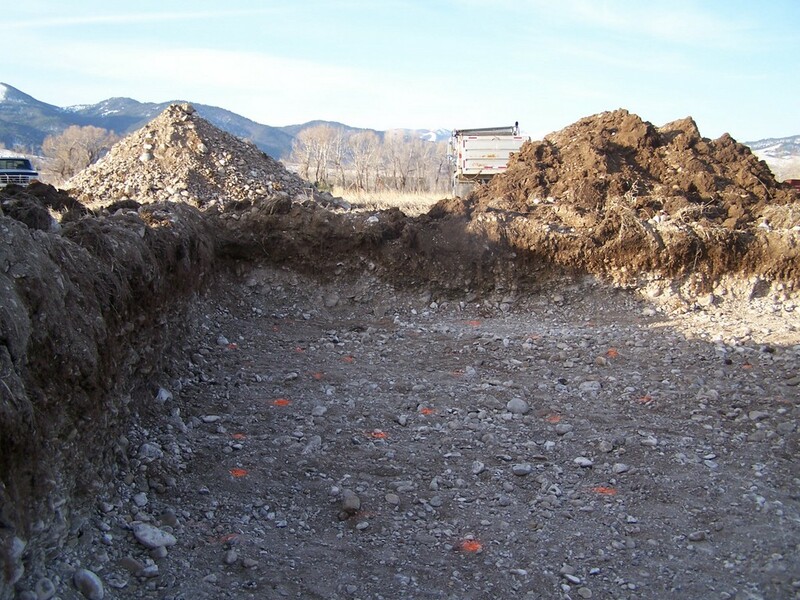 Another feature of notice is I believe the excavator also separated out various piles of material from the foundation. 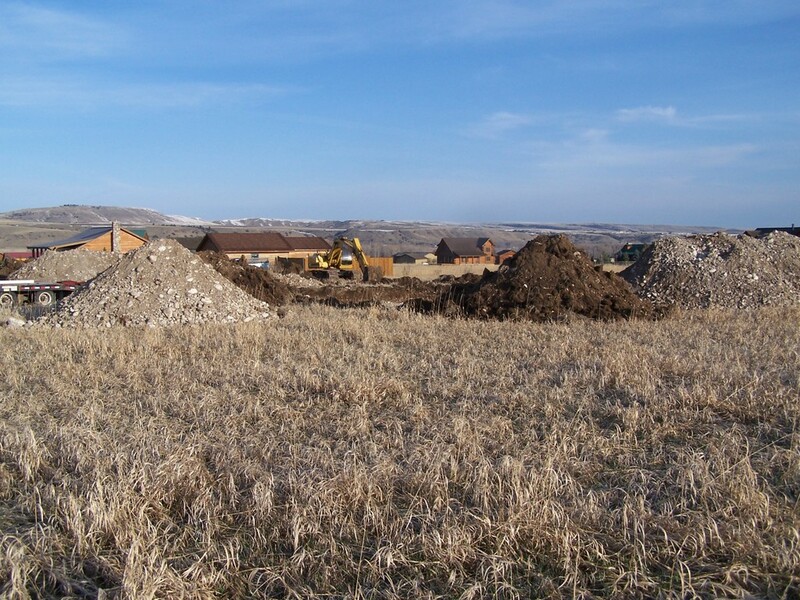 The darker mound in the center looks like top soil while the deeper digging was set aside separately. The next phase is pouring of the cement. While this work was accomplished the first part of this week, we awoke to rain on Thursday so the cement may have to wait until next week. The log shell and materials are due to arrive towards the end of June. We want this foundation to have a lot of time to cure before the logs arrive. After the footers and walls are poured we will continue with the building of the sub floor.